Cravings are so hard to ignore. And thus I HAVE to bake brownies. I even make a double recipe of brownies using two types of chocolate. Result? A fat but satisfied me! Well of course I didn’t finish the whole brownies myself. I plan to bring it for my friends to try out later. This recipe has been following me ever since I started baking in secondary school. It is one of the oldest and the most-used recipe and it has never once failed me. I can’t exactly remember where I got this recipe from, but this recipe is easy, so easy that you just want to keep making them over and over again. There is no need for an electric mixer – just a pot, a wooden spoon and an oven. Some people like their brownies to be more cake-like while some like them to be more gooey. I love both. They are just so hard to resist. 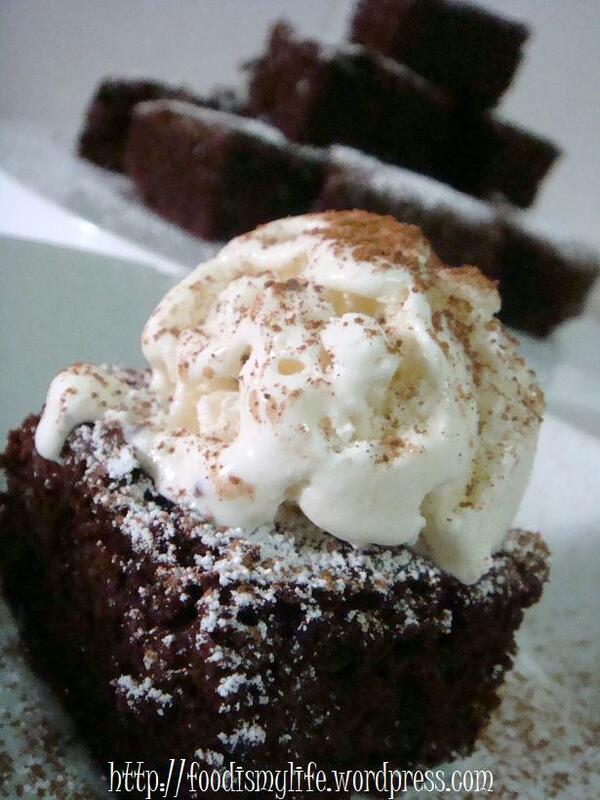 The rich chocolate flavour of the cake-like/gooey brownie together with a scoop of vanilla ice cream – and to be more extravagant, a drizzle of chocolate sauce – mmm… heavenly and SO irresistible. 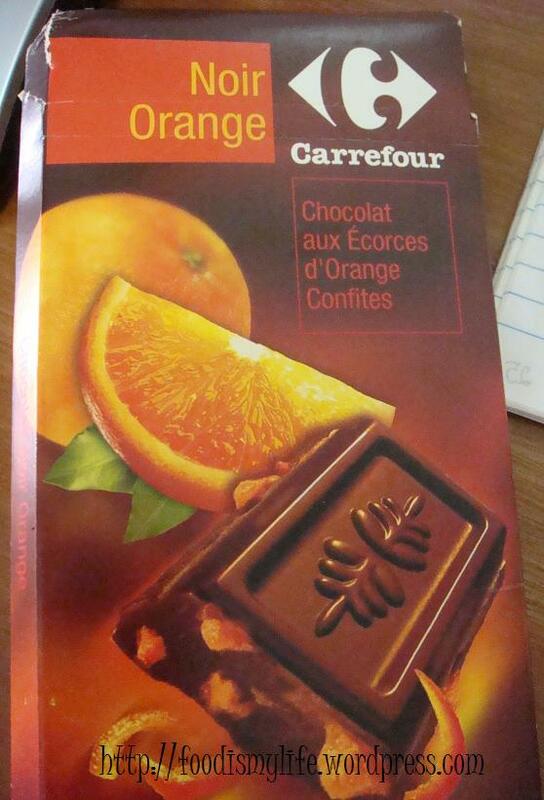 I made my first batch of brownies using orange chocolate that I got from Carrefour. It gives the brownies a tangy and citrus-y flavour. The chocolate also has orange peel in it, hence giving the brownies an additional twist to the tongue. However I still the prefer the second batch of brownies – made with a mixture of semi-sweet chocolate and dark couverture chocolate (of minimum 70% cocoa). 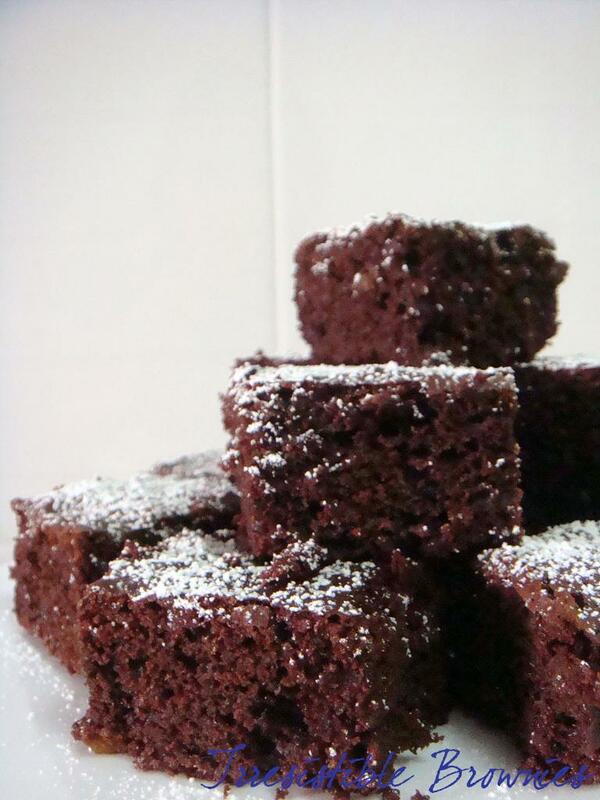 Dark and rich, these brownies are seriously the bomb. Yum. And now here’s the secret! Combine sugar, evaporated milk and butter in a saucepan. Cook over medium heat, stirring with a wooden spoon constantly until the butter has melted and the mixture has come to a boil. Remove from heat and stir in chocolate until all of the chocolate has melted. Beat in eggs and vanilla essence. Gently stir in flour and baking soda until incorporated. Pour batter into prepared baking tin. Bake for 30 to 35 minutes. 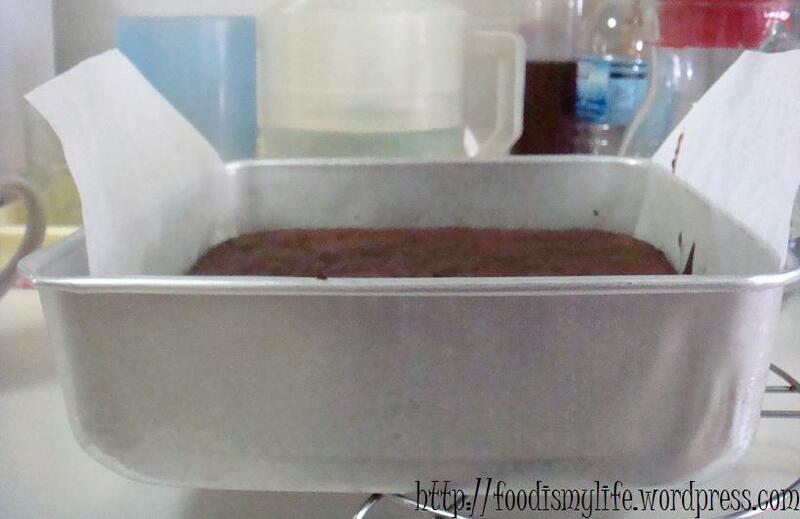 Leave brownies to cool in tin and using the extended sides of the baking paper, life the brownies out. Cut into 16 squares. 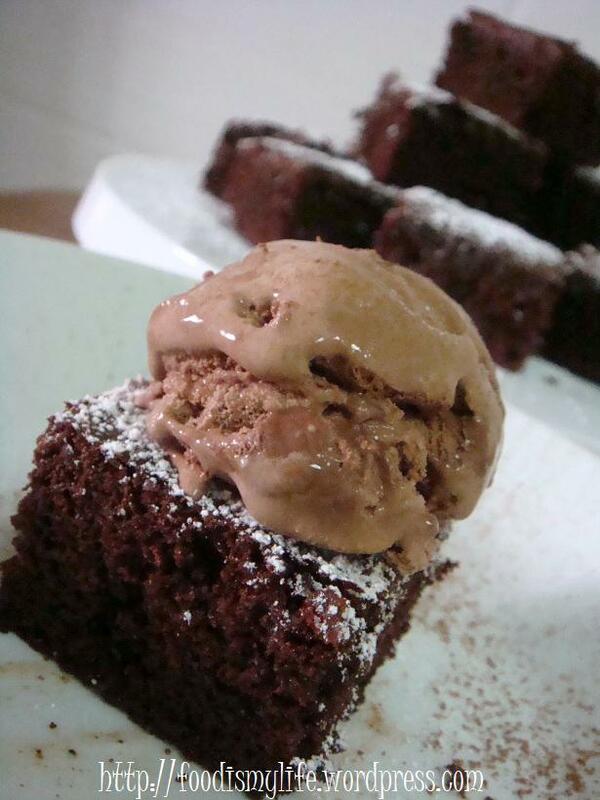 Dust with icing sugar and top each with a scoop of vanilla ice cream and serve immediately. On a side note (once again), I’ll be away for another camp for a week. 🙁 I really want to bake egg tarts and cheesecake. Shall see how! Till then! I TOTallly Dig your browniEsss so darn nice@!!! let me tell you a secret, jasline is eating so much she is becoming a pig! but her brownies are damn nice! haha..
See you around in school! Take care! can i bring you home please????? ?